News 2:They may look-like a small child's toy - with Legos, lights and batteries. But these small robots may one day carry much more importance during emergencies. They're different than remote-controlled robots already in use during search and rescue missions. Chad Burns: "this thing was working great about 2 hours ago..it's unbelieveable"
Dr. Jerry Weinberg: "The robot that can go through a building and locate victims and then alert to human rescuers where they're at." News 2:Teams of SIU Edwardsville engineering students are building "autonomous" robots - meaning the computer-programmed robots can react on their own during an emergency such as an earthquake or tornado - not only reducing the safety risks of workers - but requiring less human oversight - so workers can focus resources. Dr. Jerry Weinberg: "The goal eventually is to get where a single person could control the robot or the robot could go off on its own and locate victims and then indicate where they're at." News 2: The robots have sesnors that read light, color and sound. 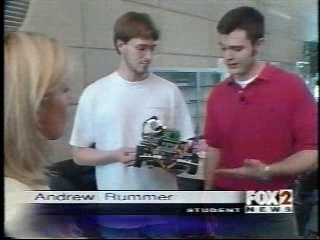 News 2: Brad Blackard and Andrew Rummer added a special recording to their robot. Robot: "Please remain calm...help is on the way." News 2:While this particular project focused on a search and rescue mission - the robots found small doll "victims" trapped in a building - students have taken their research even farther. News 2: A group invented a land mine search robot which they're taking to a national competition this fall. Andrew Rummer: "We're lucky to be working on something like because of the potential it has to save lives and keep people out of harm's way." News 2:Not only do the robots find victims and alert rescuers - but the computers actually map a route for emergency workers to follow to get to those victims.